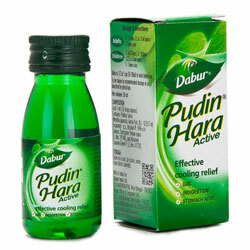 Pudhin Hara has Pudhin ka Satva which has been scientifically proven to have excellent pain and gas relieving and digestive properties with a unique "Cooling Merchaniam" that cools the stomach, resulting in a quick and natural solution to stomach problems. Alizarine Cyanine Green - F.C.No. 61570:0.0553 mg.